The 3rd National Agrarian Reform Fair, organized by the Landless Workers’ Movement (Movimento dos Trabalhadores Rurais Sem Terra – MST), started this Thursday (3) in São Paulo, Brazil. The four-day festival has already become an important cultural event in the city. The numbers are astounding. There are about 330 tons of 1,200 products coming from all five regions of Brazil. More than 900 small farmers are engaged in the production that will be offered to the population in four days. For three years, the National Agrarian Reform Fairs have been taking a massive cultural event to the Água Branca Park, in São Paulo. This year, visitors will have the chance to see live concerts of great Brazilian artists such as Siba, Tião Carvalho, Ana Cañas, Otto, Ilê Aiyê, and Martinho da Vila, as well as musicians who are partners with the MST and the drum section of Paraíso da Tuiuti, the award-winning samba school that portrayed Brazil’s president Michel Temer as a “neoliberal vampire” in this year’s carnival parade in Rio de Janeiro and became a fan favorite among Brazilians. Ana Chã, a member of the MST Culture Sector, explains that the cultural programming at the fair not only intends to appeal to the audience, but is also a way to convey the cultural dimension of the everyday struggle for land reform. The fair also includes a lot of activities for the kids. They include performances by the theater troupes Companhias Benedita na Estrada, Colhendo Contos, and Fera Neném, and also a dedicated space for children to honor Brazilian poet and author Carolina de Jesus. 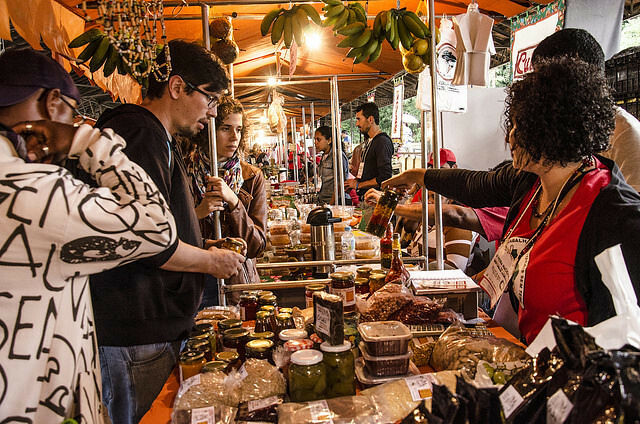 The 3rd National Agrarian Reform Fair takes place from May 3rd to 6th at the Água Branca Park, in the West Area of São Paulo, from 8am to 8pm. Entrance is free of charge and people of all ages are welcome. There will be talks and presentations about a series of topics, including agroecology and the use of chemicals in food production, as well as a dedicated space to discuss and honor councilwoman Marielle Franco, more than 30 days after her murder, where there will be talks about the genocide of Brazil’s black youth and from the outskirts in the country.